In the span of just a few months, President Trump has made significant changes to the United States’ role in the international community. Trump removed the United States from the Iran Nuclear Deal and held discussions about creating a new deal with North Korea; he moved the U.S. Embassy in Israel from Tel Aviv to Jerusalem, and recently removed the United States from the UN Human Rights Council, to name a few. Trump publicly praises Kim Jong-un and sides with Vladimir Putin while criticizing Canadian Prime Minister Justin Trudeau and the European Union. The Trump administration has given new meaning to partnerships, deals, negotiations, treaties, understandings, covenants, and indeed all of international relations. What does this mean for the future of international affairs? How does the United States move forward within the liberal world order if our international institutions are being threatened? First, we need to understand that international relations have very little to do with international issues. The administration seems keen on the domestication of international affairs—that is, making foreign policy decisions based on interests at home. Make no mistake, Trump’s recent policies are not made loosely; he is purposeful in his decision-making. Moving the U.S. Embassy to Jerusalem appeases the evangelical base of conservatives who, in large numbers, helped to elect Trump. The newly imposed tariffs on steel and aluminum were created to protect the U.S. manufacturing industry, while withdrawing from the COP21 Paris Climate Agreement was a nod toward U.S. coal, petroleum, and natural gas groups. 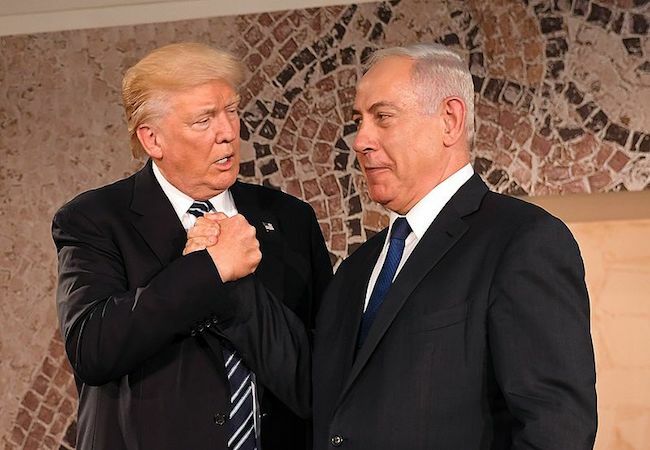 The president’s close relationship with Israeli Prime Minister Benjamin Netanyahu could explain his hardline stance against Iran, despite his softening on North Korea. Not to mention the personal glory, and potential financial gain, of achieving the denuclearization of the Korean Peninsula. The Trump administration is clearly making important international policy decisions to help garner political support from conservative Christians, donors, manufacturers, the fossil fuels industry, and more. He is domesticating what should be international. But President Trump is not making feckless decisions. He is putting “America First” in his own mind. But what’s best in Trump’s mind is not necessarily best for America. His general policy of “America First” would be more accurately stated as, “L’état, c’est moi”: the state is me. It’s Trump versus the world. Not America versus the world. But this isn’t meant to be an anti-Trump diatribe. We must remember international policy has answered to domestic interests before. Isolationism and “America First” is not new. But the post-World War II order made way for a new paradigm of international engagement where the United States led on the global stage. We gave more credence to international institutions, cooperated with democratic allies, and put our trust in the diplomatic corps, our military, and intelligence agencies to carry out international relations in our best interests. Under President Trump, he alone is running international relations and is acting on behalf of lobbies loyal to him. In setting aside national security and long-term international competitiveness in order to answer to powerful lobbies at home, the president’s loyalty to these lobbies could undercut the importance of the international institutions we have worked so hard to build. We propose a full court press. We must encourage our institutions to look beyond our own national interests. We can maintain America’s place in a world built on relationships and cooperation, striving towards peace. Public diplomacy can help us achieve these goals; regional leaders, like mayors, governors, business leaders, educators, and those in the arts and entertainment industry can fill that role. Local leaders like Los Angeles Mayor Eric Garcetti and Deputy Mayor for International Affairs Nina Hachigian are enhancing LA’s position on the global stage by promoting action on climate change, encouraging trade, and welcoming immigrants. New York City’s Office for International Affairs, led by Commissioner Penny Abeywardena, is focused on promoting the UN’s Sustainable Development Goals and connecting New Yorkers to the global diplomatic community. Cities like San Diego, Seattle, and Vancouver cooperate frequently, as do Miami and Havana, and El Paso and Ciudad Juarez. Here at the Pacific Council on International Policy, we are working to establish the West Coast as a foreign policy powerhouse. There is an increased desire for cities to establish themselves globally, especially now as the United States finds itself isolated from the international community. But we need to do more. Congressional leaders must step up and speak to the great partnerships the United States has with the world by highlighting our alliances with Canada and Mexico. They should speak to the importance of international institutions like the United Nations, and the significance of joining and adhering to multilateral agreements with our allies. And educators, artists, entertainers, and business leaders should do the same. Encourage international cooperation and engagement. Facilitate connections with our allies. Teach students about the global community. American interests can still be served, and even optimized, by collaboration with international actors. L’état, c’est moi. But not for long. Madison Jones is the Communications Associate at the Pacific Council on International Policyand a graduate of USC’s Master of Public Diplomacy program. She previously worked at the USC Center on Public Diplomacy. Justin Chapman is a journalist, author, and the Communications Officer at the Pacific Council on International Policy. He is a student in USC’s Master of Public Diplomacy program. South Asia: Is Afghanistan ready to provide equitable access to quality education for girls?